Today, I want to walk you through the Feiyu Tech G6 review I wrote after testing it few days ago. The latest Feiyu Tech gimbal is the G6 replacing the G5 gimbal which you might have already heard about. The G6 is a 3-axis gimbal stabilizer and from the first look, it looks like other stabilizers on the market. Compatible with: GoPro Hero4/5/6/7, Yi 4K, other action cameras. Smartphones and small Sony digital cameras like the RX0. Battery: 5000mAh, 3.7V (Lasts up to 12 hours). The G6 size is a bit bigger than the G5, it has bigger motors that deliver more torque. According to Feiyu tech, that will give you a smoother image and less jitter and shake in certain situations. So if you do have a handle for the G5, it will be no longer usable. Both gimbals are splash-proof so very useful when filming in wet conditions. The G6 has more features and buttons like WiFi and Record button which I will talk about in a few moments. Before I get too far into details, I will go first through everything that goes into the box. There is an aluminum tripod that’s actually seems to be very heavy duty, nice quality built to it. First of all it gives you a tripod if you want to set your gimbal up but it also acts as an extension handle so if you want to get that little bit of extra handle reach, you can do that as well. The package also came with a mount for the GoPro Session and according to the box, this will also work on the Feiyu tech G5, so this basically just replaces the mount and that you can put a GoPro Session there. It also came with some shorter screws, the ones that are pre-mounted in there, and this is for different types of cameras, because the G6 and the G5 are compatible with many different cameras. If there’s a camera that is a little but thinner than the GoPro Hero6 or Hero7, then it is the short screws. This gimbal comes with a cylindrical shaped battery, it has 3.7Volts and 5000mAh. The website says that it can provide up to 12 hours of charge which is pretty good. There is a micro USB charging cable and one pass through cable which allows you to charge your GoPro or smartphone from the battery within the handle. 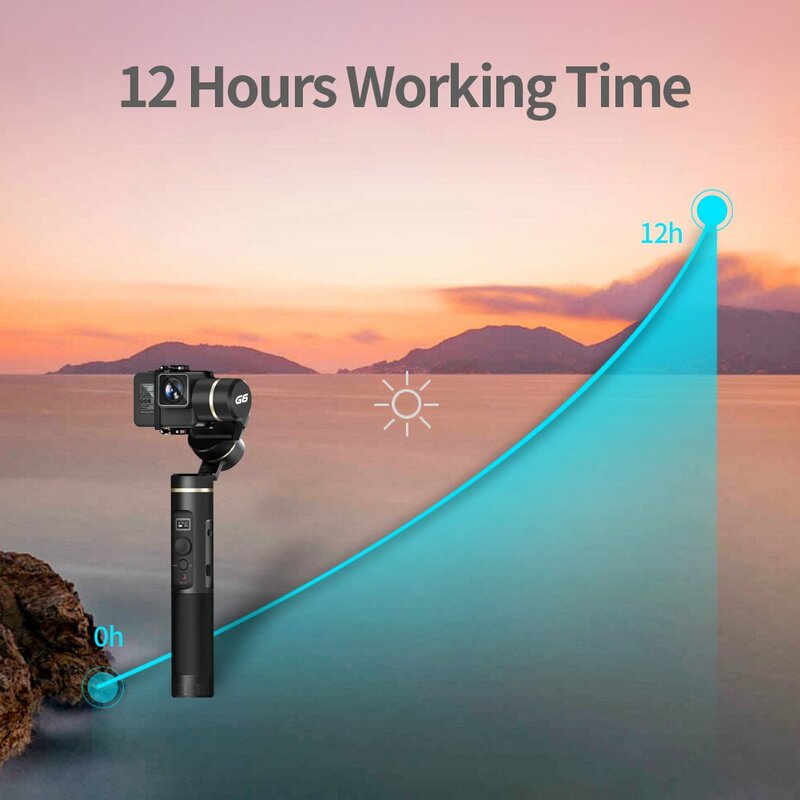 Since the battery in this gimbal is rated at 12 hours usage, there will be a lot of charge in there for your GoPro or smartphone (with a USB-C port). So in case you need to charge, you just connect the small pass through cable to the G6 gimbal and the camera. You can basically remove the GoPro’s side door and connect the USB-C side into the GoPro and the other side into the G6 gimbal. The gimbal needs to be powered on for that pass through (charging) to work. As for the G5 there are two ways to mount the GoPro Hero5 or Hero6 on the gimbal. 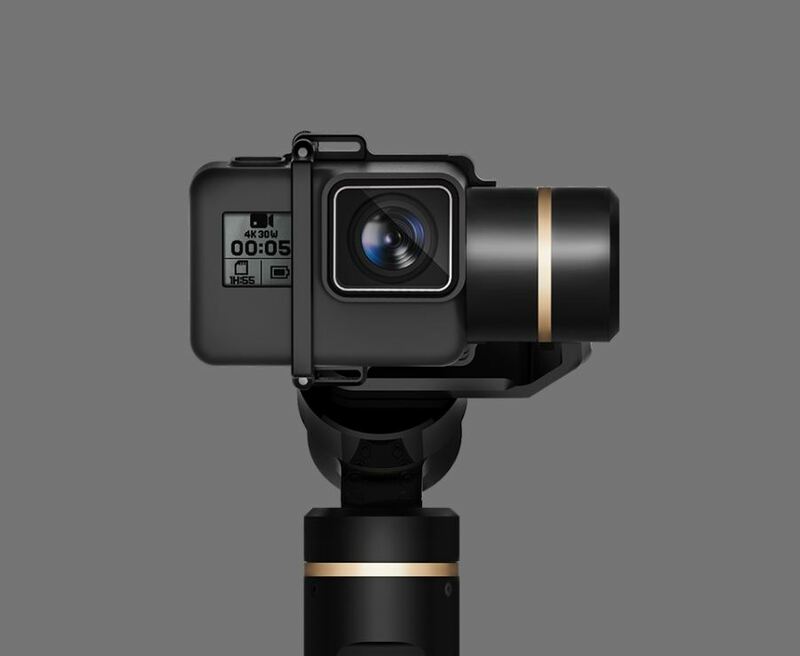 If you have a GoPro Hero5, the first way is mounting it is with the “Mode” button against the gimbal which is not practical since it will be blocked and you won’t be able to turn the camera ON or OFF. Now with the Hero6, it’s not really an issue since the Hero6 can be turned ON using your voice. However with the Hero5 you need access to the Mode button unless you use the button at the top. You can also flip it the other way and you can mount it by having the battery door on the gimbal motor’s side. 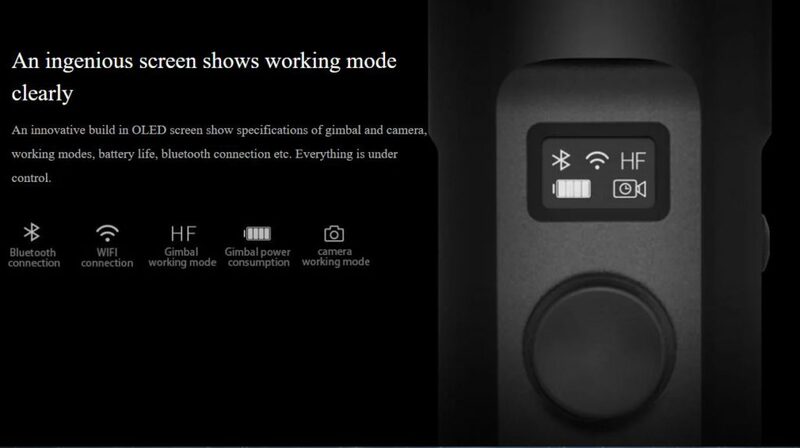 Then you have access to the Mode button however you won’t have access to the battery door on the Hero5 or the Hero6 and 7, if you want to charge your battery via the gimbal. Now one thing that is different that I really actually like is that on the G5 if you were mounting the older GoPro cameras such as the Hero4 series or some other action cameras brands. They had a way that it had to take on and off, because the camera balances differently, now with the G6 they have eliminated that problem by having a sliding arm to balance the camera. That’s kind of nice that we don’t have to carry a weight with us, that works like the Feiyu tech G2. You just have to twist the knob and slide it back and forth until the camera balances. You want to kind of balance it so that it stays level and then you tight it in and then when you power it on, it will all be balanced. Feiyu Tech first listed the G6 on their website as water-proof, but they changed this later to splash-proof same as the G5. Not sure if a waterproof gimbal comes in handy but I wouldn’t want to use it underwater anyway and I don’t really need to. 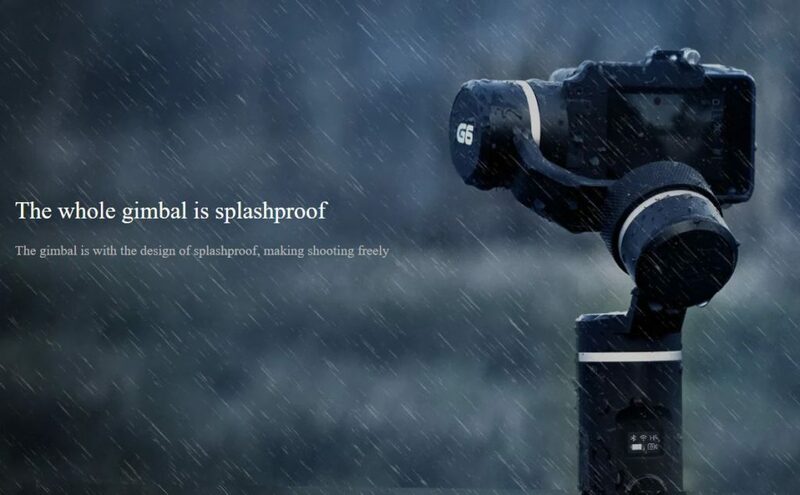 Having the gimbal splash-proof is beneficial in case I’m filming under the rain or in wet conditions. I just want to point out that if you own the Feiyu Tech Bluetooth remote, it is fully compatible with Feiyu Tech G6. I have one but never felt the need to use it. I always use the app or the buttons on the gimbal itself. Let’s talk about the design! In the Bottom of the gimbal, they changed how you connect handles. On the G5 there is has a larger threads on the outside that you could screw a handle in, such as the one I use with the G5 but it doesn’t fit the G6. They do have a new updated version of this handle and it’s compatible with both the G5 and G6. However the nice thing about that is that you don’t need a proprietary handle anymore. We also have a tripod mount on the side, and one that is kind of new, it’s the flat surface on the side of the gimbal which makes it easier to mount other accessories. At the front, you will notice that it has a new screen. It displays various information which I will talk about in a few moments. It got the joystick like on the G5, a power button and switching modes and there is a new record button. On the back, you have a trigger button just like the G5. But on the G6 there’s a new button. This is kind of like the joystick on the front, where you can turn it up and down. This actually twists it side to side. It might not be very necessary but you will have the option to twist the camera. On the other side, you have a Settings button. 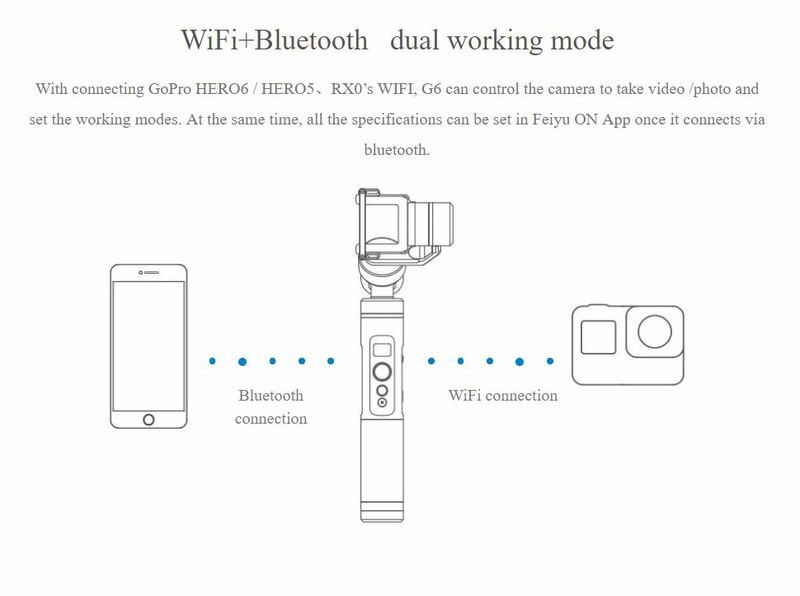 Talking about Settings, one of the nice new features is not only can you connect to your iPhone or Feiyu Tech app via Bluetooth, but you can also connect your G6 gimbal via WiFi to your GoPro and control the GoPro with the buttons. You can change modes, go from Video mode to Photo mode. You can change few settings like Field view and Video resolutions, you can also start and stop recording. Connect your Gimbal to your GoPro via WiFi! So to connect to WiFi, you have to connect to the Feiyu Tech app via Bluetooth. In there, there is an option to connect the G6 to GoPro. One tip though, when you connect the G6 to your GoPro’s WiFi, you have to switch the WiFi in the Gopro back to 2.4Ghz back from 5Ghz. The Feiyu Tech cannot detect the 5Ghz network. This won’t be an issue if you are using a Hero5 or the Hero 2018 since broadcast WiFi in 2.4 Ghz. They have done that in order to enable the camera to move more freely. Another change is in the form factor and design which makes the axis’ angle made in such a way that it doesn’t block any part of the screen and that has no effect on the anti-shake performance. On the screen, you will see a lot of different information. One icon shows the Bluetooth symbol and another the WiFi. The icon HF is the mode that the gimbal is in, this is the panning mode. It means that as you turn the camera, the horizon will stay straight and it will go from side to side. If I click the Mode button once, it will go to Lock mode or LK. So now it’s in Lock mode, the camera will always face forward if you for example move it up and down. It’s not gonna change. The other is Follow mode, we achieve that by doing a double tap on the mode button. In follow mode, the camera will follow your movements whether its up or down and side to side. And then in a given time, no matter what mode you’re in you can lock the camera’s position just for a quick second, you can hold the trigger button down at the back. And no matter what mode you’re in, if you want to go back to normal mode, just double tap the trigger button and it will reset everything. Triple tapping on the Mode button puts it in Selfie Mode. That’s great if you’re filming stuff and then you want to take a video of yourself. Just triple tap that button, it will turn 180 degrees and the camera will face you. To go back, just double tap on the trigger button and it will go back to the normal position. You can turn the camera up and down or side to side, using the joystick just like on the G5. Now on the back, you have that Tilt wheel which will make the camera film on a tilt, not sure what this is useful for but maybe you need it. The next icon on the screen is the battery level indicator. The other icon is what mode we’re in on the GoPro (video, photo, time lapse video, etc..). I can use the button on the side to change the mode on the GoPro. This is very handy to be honest, all can be controlled from the G6. If you long press the side button, you can go into the GoPro settings so you can change video/photo settings using the gimbal’s joystick. lastly at the bottom, the record button is to start/stop video or capture photos. Similar to the GoPro Karma Grip. The G6 also comes with a hard case, it gives extra protection especially if you do a lot of travelling. The gimbal will go in the case with the GoPro attached which is a good thing as you can fit both in the case. Another nice thing about the case is the ability to fit another GoPro in the same space of where the battery was when you first open the case. The other compartment can be used to store your cables or any other small accessories. Everything will fit nicely. All in all, the G6 packs a lot of nice features. I’m personally very satisfied with the video quality that this Feiyu Tech G6 stabilizer provides. I can’t really fault it, I got good footage from it. It works really nice and as I said earlier you can use the app to tweak the motors. The motors are pretty strong and you can make them work as you want. The price might be a bit on the high side, but remember that this gimbal can be used with different camera sizes and types like smartphones, small digital cameras, GoPro and other action cameras. So value for money is pretty good.